If you are graduating in May, then this is your last semester. For some seniors, that fact gives them drive and energy to hit this last semester hard, and for others, the future that is coming after graduation is horrifying. This author is a senior, and I am terrified. Why would graduating be scary? Well if you are about to graduate chance are you have thought about all the change that is about to come. Maybe graduation means moving to a new city, state or even country. Maybe graduating means it’s time to start paying your own phone bill or insurance. More existential crises can occur if you’ve thought about your soon-to-be-finished degree: have I spent my last four years preparing for the career I really want to have for the rest of my life? Will I even be able to find a job? All of these legitimate questions and concerns about “real adult” life, a life that starts in May, is stressful; the pressure can be too much! All these things feel like life-changing events, and once May hits nothing will ever be the same. Why graduate then? 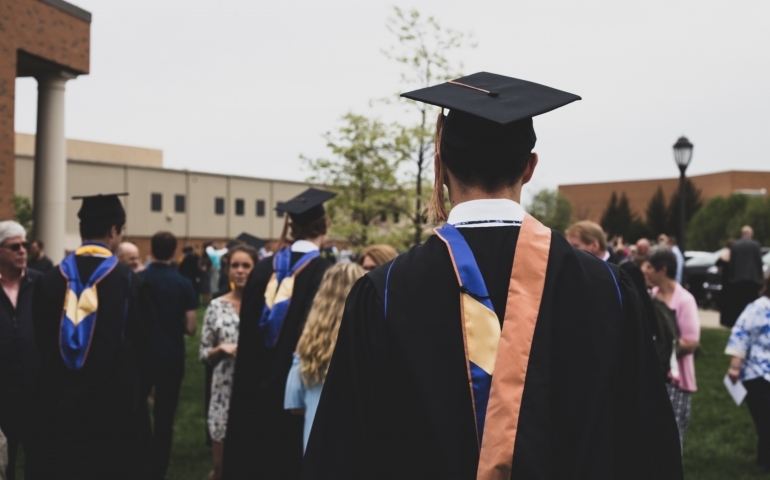 Taking a 5th, 6th or 7th year does not sound as bad as having to face all these new challenges, plus you can defer those student loans even longer. So, as we seniors start our final semester thinking of all the things that could make us lose sleep with the amount of stress they bring, there is one thing that we must remember: to make the most of our final semester at Southern Nazarene University (SNU). Yes, I am terrified of the future, and all these things make me want to just throw in the towel, but there is so much more to life that is to come after May. Not only is there a great future to come after May, but there is also time left to make the most out of this last semester. I do not want to stay up far too late worrying about the future; rather, I want to stay up far too late going on a last minute honey butter chicken biscuit run with my friends. I want to take every opportunity to make the most of this time that is left. If you are a senior, then this advice is for you. If you are not a senior, remember that there is plenty of times in life where the future is scary. Do not let the time you have pass you by in worrying about things that seem so much more terrifying from afar. Take this semester and make the most of it. Tell a professor how much they mean to you. Take your friends on a crazy adventure on a Thursday night. Tell people how you feel, forgive people who do not deserve it, and make memories. I am a senior, I am terrified of what the future may bring, but I am going to try and make the best of this last semester.